The other day, I read an article from PressBox Online‘s Todd Karpovich titled Towson Men’s Lacrosse Relying On Improved Defense For Tough Stretch. It got me curious about the early stretch for the Tigers, how it compares to last season’s team, and what it might mean for the remainder of the 2018 campaign. The crux of the article was that Coach Shawn Nadelen was sounding an optimistic note after Towson’s win over UMBC last Saturday and with an upcoming tilt against Ohio State on the horizon. There were quotes about continuous improvement and praise for the Buckeyes. One thing that stood out immediately was that the UMBC game did not seem to be a turning point for the defensive unit, which currently sits 62nd among Division I teams. Thus far, the Tigers have allowed goals on 34.1% of opponent possessions. And looking at the game by game results, they’ve allowed opposing offenses to punch above their weight. The UMBC game was no different. It was the 5th straight game to start the season in which the Tigers’ opponent outperformed their offensive efficiency averages. Holding a team to 6 goals is outwardly impressive, but remember that UMBC currently ranks 68th in the country on offense. Compare that with last year’s team, which held 13 of 17 opponents under their season average in terms of offensive efficiency. It may be that last year’s defense will reassert itself, but so far, Nadelen’s defense has already had more teams outperform their benchmarks than they did all of last season. Is this an offense-first team now? That header line is a bit facetious. It’s early. It’s been 5 games. More likely than not, Towson’s defense will start to perform better and this team will play a lot like last year’s team. We have already written about how much this team lost to graduation, so it was natural that there would be a significant adjustment period to start this year. But I always find it interesting when there is a divergent stat between games that a team wins and games that a team loses. So what do we see with Towson’s 2 wins vs 3 losses. 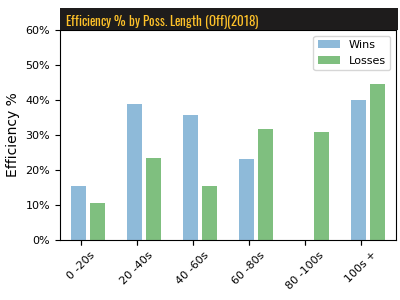 Call it opportunistic or aggressive offense, but their efficiency rates in quicker possessions are starkly different in their two wins. The blue bars in the chart above show the efficiency rates for possessions of varying lengths in the two victories. In their two victories, the Tigers have scored at higher rates in possessions lasting between 0 and 60 seconds (i.e. quick possessions). Someone who watched all these games could tell me whether this was the result of miscues by opponents or aggressive offense by Towson. But the bottom line is that in wins they’ve found more success in quick possessions. In losses, they’ve been better the longer the possession lasts. And importantly, they’ve had a larger percentage of quicker possessions in those wins. In their two victories, the most common possession lasted between 20 and 40 seconds. In their three losses, the most common possession lasted between 40 and 60 seconds. And you can see that the chart is skewed toward shorter possessions in the victories relative to the losses. 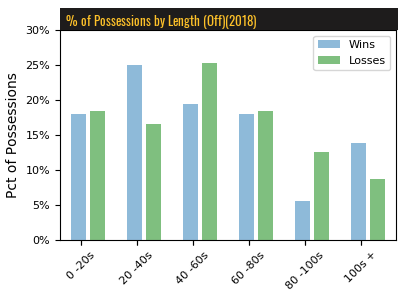 So when they’ve won games, they are A) getting more possessions with opportunities to shoot quickly and B) they are converting those possessions into goals at a higher rate. 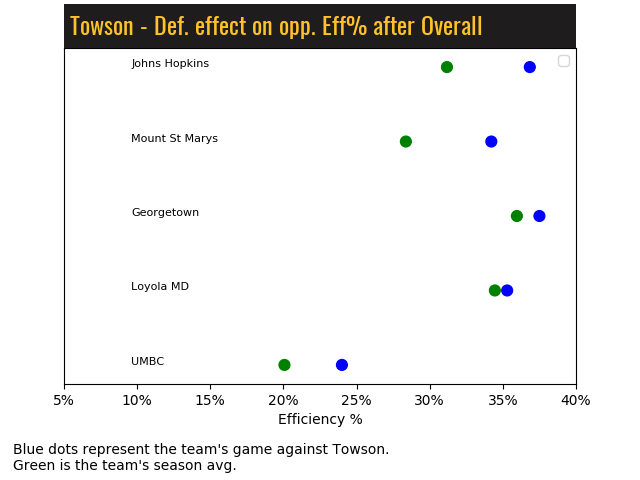 If that pattern is purely the result of mistakes by opponents, then I’m not feeling optimistic that Towson’s offense can carry the team as their opponents get stronger. But if it is the result of the offense, led by Jon Mazza and Timmy Monahan, being aggressive and making the most of opportunities to push the pace, then this could be a season-long strength for this team. Building on those points, here is the game by game pace chart for Towson. 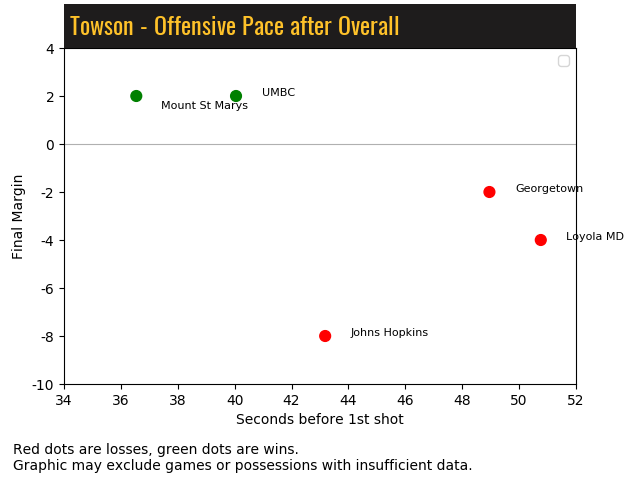 In their two wins (green dots), Towson has taken a shot after 36 and 40 seconds of gaining possession, on average. In three losses, they’ve come after 43, 49, and 51 seconds on average. There are many reasons for a team to play offense at a slower pace, chief among them the opposing defense taking away good scoring chances. But at the same time, I would think that there is at least a slight natural tendency for a team that relies on defense to be more risk-averse on offense. Wait for the ideal opportunity, make sure the defense doesn’t get worn down; that sort of thing. 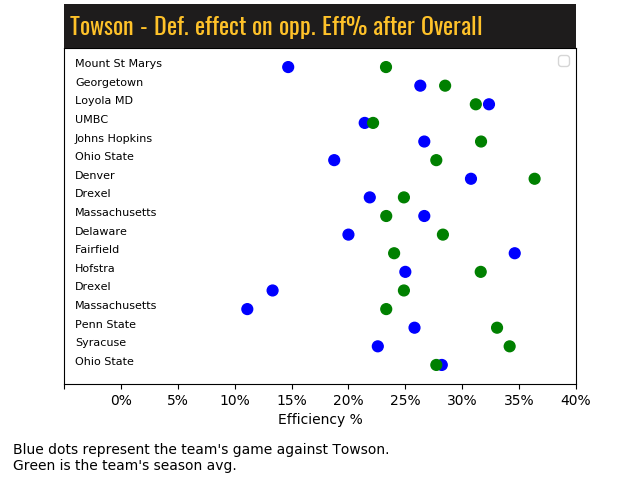 But the early season data says that that may be a counter-productive approach for Towson. If they are going to rely on the offense, and the offense is going to be better in quick strike chances, then doing anything that reduces the number of early possession chances they take is not going to help matters. It’s a bit of a rock-and-hard-place situation until the defense gets it going. And honestly, that is my big takeaway from this quick look at the Tiger’s stats. I would suggest not putting too much stock in a sample of 5 games. Statistically, let’s see where they are at the end of March. The key though, is that this is a very different team than last season, when they had a breakout season. For a relatively new coaching staff, the real challenge is adjusting their strategy and philosophies to match the players on the roster. If this is a team that has to win in a fundamentally different way than last season, it’s up to the coaches to make sure that they do what they can to enable that.